I went with my son to get some fresh veggies from our known nearby vegetable shop last week. The moment I saw these super cute Fresh Baby Potatoes, I started putting them for weighing. My son was surprised to see such small baby potatoes and screamed at me saying "Mamma! Those are so tiny potatoes. They didn't feed it well. Why are you buying those? They haven't grown up still". Everyone nearby had a light cheerful moment. Choo Chweet! Now getting back to the recipe, I roasted them on a frying pan with little oil and other spices. This can also be done in oven/grill. It was spicy, cute, colorful and yummy. 1. Poke the potatoes with a fork and boil them in microwave with little salt and water in a microwave safe bowl for appx 10-15mins or till they are almost done. 3. Add All the ingredients mentioned above except oil to the boiled and peeled baby potatoes. Mix well till all the potatoes gets coated with the masala. 4. Heat 1 tbsp oil in a frying pan. 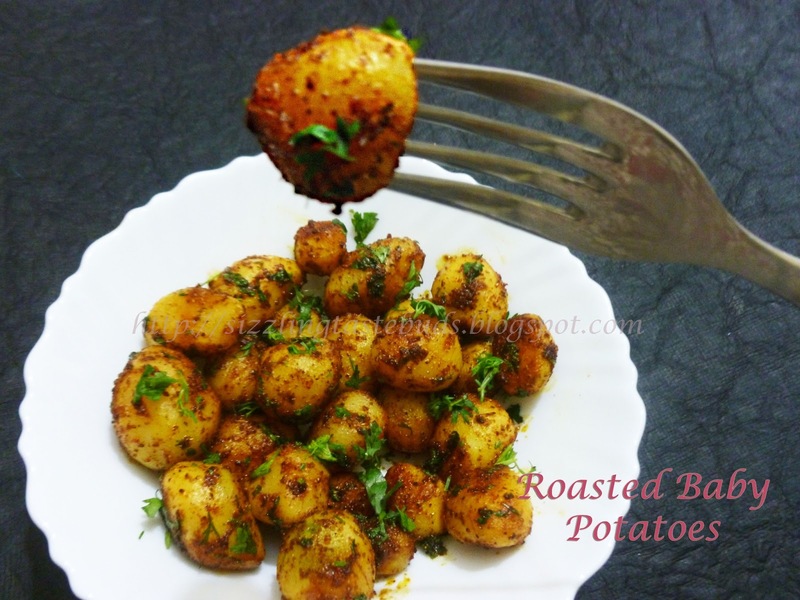 Add these masala coated baby potatoes into the frying pan and mix it. 5. Cover the lid and cook it in a low flame. Give a stir now and then till the potatoes are competely cooked and gets little roasted texture and flavor. 6. Garnish with freshly chopped Coriander leaves. 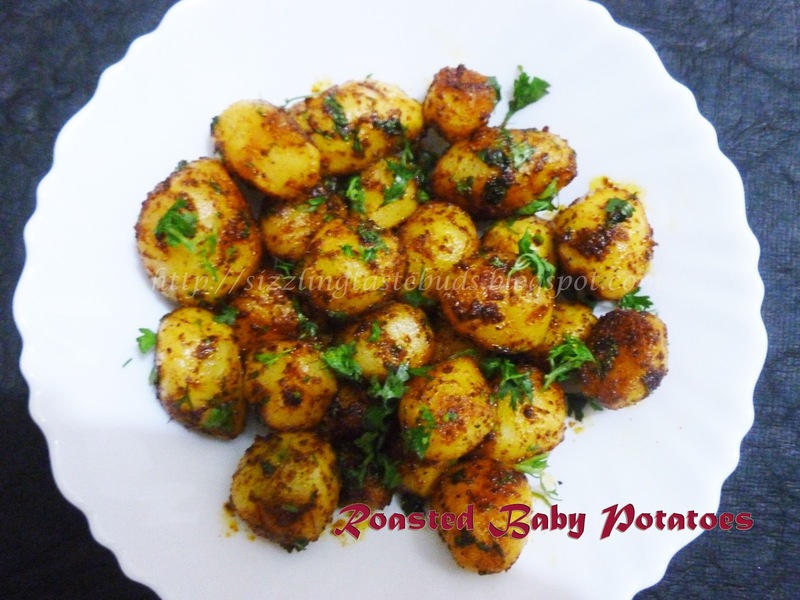 Prepare this dish with the regular potatoes cut into medium sized cubes in the absence of baby potatoes. This dish can be prepared in oven to get totally oil free yummy dish. Potatoes can be marinated with the masala for few minutes. I didn't marinate those. Still was able to get all the added flavors.